Hospital discharge planning plays a key role in shaping downstream PAC use in terms of the numbers and types of patients discharged to different PAC settings. However, no clear clinical guidance exists to determine the type of PAC setting to which a patient with a specific condition should be discharged. Discharges to PAC often are driven by the availability of specific types of settings and by financial incentives that are not always aligned with clinical needs and may not be cost-effective.5 Current studies on discharges to PAC are based on either Medicare FFS patients using Medicare claims data or small clinic-based cohorts using primary data collection. To date, there are no estimates of discharges to PAC based on a national all-payer dataset that can offer a complete picture including not only Medicare FFS but also other payers. This Healthcare Cost and Utilization Project (HCUP) Statistical Brief presents data on hospital discharges to PAC settings in 2013 from an all-payer view. Using the 2013 National Inpatient Sample (NIS), this Statistical Brief estimates discharges to PAC for all types of payers and describes these discharges from the perspective of payers, patients, hospitals, conditions/procedures, and geographic regions. Discharges to PAC in this Statistical Brief are defined as those discharges to IRFs, LTCHs, SNFs, or home with HHA services. Discharges to outpatient PAC facilities and inpatient stays in Veterans Health systems are not included because data are not available in the NIS. All differences between estimates noted in the text are statistically significant at the .01 level or better. Figure 1 presents the number and percentage of discharges to four types of PAC settings, routine discharges, and other discharges in 2013. Approximately 7.96 million inpatient stays were discharged to postacute care (PAC) settings, accounting for 22.3 percent of all hospital discharges in 2013. The rates of discharge to PAC were 41.7 percent for Medicare, 11.7 percent for private insurance, 8.1 percent for Medicaid, and only 4.8 percent for uninsured stays. Home health agencies accounted for 50 percent of discharges to PAC. More than 40 percent of discharges to PAC went to skilled nursing facilities (SNFs). Stays discharged to PAC were much longer and more costly than those with routine discharges (7.0 days vs. 3.6 days; $16,900 vs. $8,300 on average). Total hip/knee joint replacement accounted for nearly 10 percent of all discharges to PAC, among which 54.1 percent went to home health agencies, 37.3 percent went to SNFs, and 8.4 percent went to inpatient rehabilitation facilities. Among the nine census divisions, the New England area had the highest rate of discharge to PAC, 32.8 percent. The Mountain and Pacific areas had the lowest rate of discharge to PAC, about 17.8 percent. Notes: Discharges to IRFs and LTCHs were not identified in one State. As a result, the number of discharges to PAC may be underestimated by 1 percent, with the assumption that the rate of discharge to IRFs and LTCHs in this State is the same as the national rate. "Other" discharge dispositions include transfer to facilities other than PAC settings, against medical advice, died within hospital, and unknown destination. Figure 1 is made up of two pie charts. One pie chart shows the distribution of discharge disposition between routine, postacute care, and other. The second pie chart shows the distribution of discharge disposition for stays discharged to postacute care. Number and percentage of discharges from inpatient stays: routine: 24,970,000, 70.2%; postacute care: 7,955,700, 22.3%; other: 2,670,900, 7.5%. Number and percentage of discharges to postacute care: home health agency: 3,987,900, 11.2%; skilled nursing facility: 3,219,800, 9.0%; inpatient rehabilitation facility: 576,700, 1.6%; long-term care hospital: 171,300, 0.5%. In 2013, 22.3 percent of inpatient stays were discharged to a PAC setting. Nearly 8 million hospital stays were discharged with PAC services, accounting for 22.3 percent of all hospital discharges in 2013. HHA and SNF were the two most common PAC settings to which patients were discharged following their hospital stay. Over 11 percent of inpatient stays were discharged home with HHA services, and 9 percent were discharged to SNFs. Only 1.6 percent of all discharges went to IRFs. 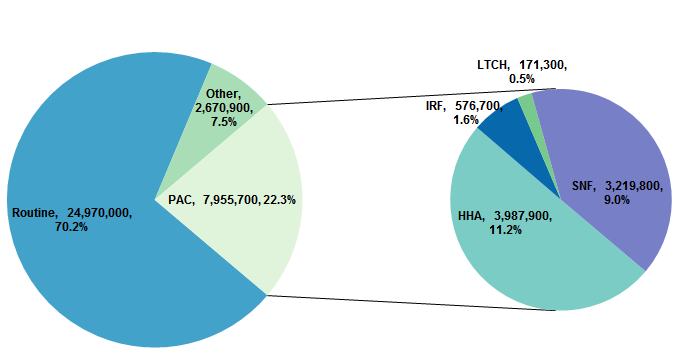 LTCH was the least used PAC setting and represented only 0.5 percent of all discharges. 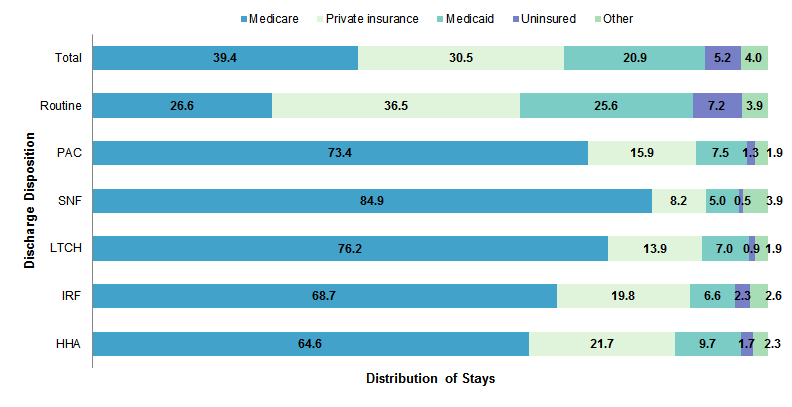 Figure 2 shows the percentage of different primary payers for inpatient stays by discharge disposition. Medicare discharges in this Statistical Brief include both FFS beneficiaries and Medicare Advantage plan enrollees. Notes: Other includes Worker's Compensation, TRICARE/CHAMPUS, CHAMPVA, Title V, other government programs, and missing. Expected primary paper was missing for 0.15 percent of all stays, 0.17 percent of routine discharges, and 0.1 percent of discharges to PAC (0.1 percent to HHA, 0.1 percent to IRF, 0.11 percent to LTCH, and 0.08 percent to SNF). Figure 2 is a bar chart that shows the distribution of discharges by payer mix for 2013. Total: Medicare: 39.4%, private insurance: 30.5%, Medicaid: 20.9%, uninsured: 5.2%, other: 4.0%. Routine: Medicare: 26.6%, private insurance: 36.5%, Medicaid: 25.6%, uninsured: 7.2%, other: 3.9%. Postacute care: Medicare: 73.4%, private insurance: 15.9%, Medicaid: 7.5%, uninsured: 1.3%, other: 1.9%. Skilled nursing facility: Medicare: 84.9%, private insurance: 8.2%, Medicaid: 5.0%, uninsured: 0.5%, other: 3.9%. Long-term care hospital: Medicare: 76.2%, private insurance: 13.9%, Medicaid: 7.0%, uninsured: 0.9%, other: 1.9%. Inpatient rehabilitation facility: Medicare: 68.7%, private insurance: 19.8%, Medicaid: 6.6%, uninsured: 2.3%, other: 2.6%. Home health agency: Medicare: 64.6%, private insurance: 21.7%, Medicaid: 9.7%, uninsured: 1.7%, other: 2.3%. Medicare accounted for nearly three-quarters of discharges to PAC. 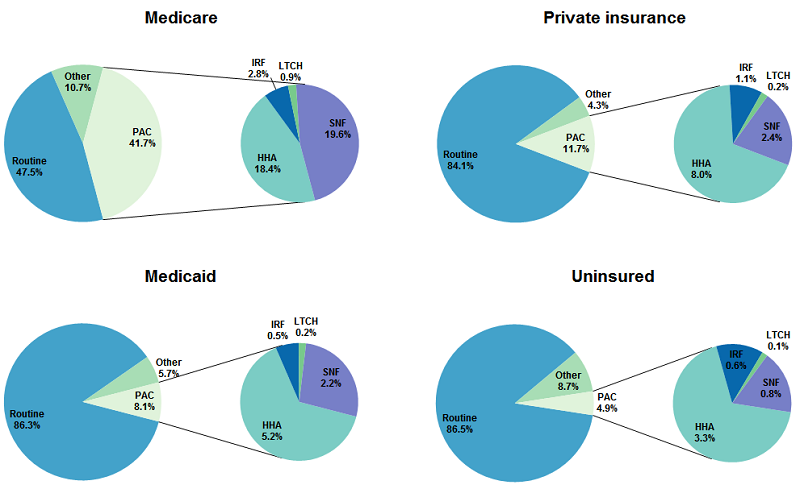 Private insurance was the primary payer for 15.9 percent of all stays discharged to PAC. Medicaid paid for 20.9 percent of all inpatient stays but only 7.5 percent of discharges to PAC. Only 1.3 percent of discharges to PAC were uninsured. Figure 3 shows the percentages of discharge to each PAC setting, routine discharge, and others by payer group. Figure 3 is made up of four sets of two pie charts, one set for each payer. For each set, one pie chart shows the distribution of discharge disposition between routine, postacute care, and other, and the second pie chart shows the distribution of discharge disposition for stays discharged to postacute care. Medicare: all discharges: routine: 47.5%, postacute care: 41.7%, other: 10.7%; discharges to postacute care: skilled nursing facility: 19.6%, home health agency: 18.4%, inpatient rehabilitation facility: 2.8%, long-term care hospital: 0.9%. Private insurance: all discharges: routine: 84.1%, postacute care: 11.7%, other: 4.3%; discharges to postacute care: home health agency: 8.0%, skilled nursing facility: 2.4%, inpatient rehabilitation facility: 1.1%, long-term care hospital: 0.2%. Medicaid: all discharges: routine: 86.3%, postacute care: 8.1%, other: 5.7%; discharges to postacute care: home health agency: 5.2%, skilled nursing facility: 2.2%, inpatient rehabilitation facility: 0.5%, long-term care hospital: 0.2%. Uninsured: all discharges: routine: 86.5%, other: 8.7%, postacute care: 4.7%; discharges to postacute care: home health agency: 3.3%, skilled nursing facility: 0.8%, inpatient rehabilitation facility: 0.6%, long-term care hospital: 0.1%. Patterns of discharge to PAC varied across payers. Nearly 42 percent of Medicare inpatient stays were discharged to PAC, which was the highest among all payer groups. SNF was the leading disposition site for Medicare discharges to PAC and accounted for 19.6 percent of all Medicare inpatient discharges. HHA services accounted for 18.4 percent of all Medicare PAC. Compared with Medicare, other payer groups had much lower rates of discharge to PAC. Among privately insured stays, 11.7 percent were discharged to PAC, and among Medicaid-covered stays, 8.1 percent received PAC services. Only 4.9 percent of uninsured inpatient stays were discharged to PAC. Moreover, HHAs were the leading PAC setting for non-Medicare discharges in contrast to SNFs for Medicare discharges. HHAs accounted for 61-68 percent of non-Medicare discharges to PAC. SNFs represented 17-27 percent of discharges to PAC among non-Medicare payer groups. Figure 4 presents the average costs and length of stay of acute care hospital stays by discharge disposition. Figure 4 is made up of two bar charts, one for average costs of an acute inpatient stay by discharge disposition and one for average length of stay by discharge disposition. Average cost of inpatient stay: home health agency: $15,100, inpatient rehabilitation facility: $24,200, long-term care hospital: $36,800, skilled nursing facility: $16,600, combined postacute care: $16,900, routine: $8,300. Average length of stay: home health agency: 6.2 days, inpatient rehabilitation facility: 8.2 days, long-term care hospital: 13.5 days, skilled nursing facility: 7.4 days, combined postacute care: 7.0 days, routine: 3.6 days. Inpatient stays discharged to PAC were much longer and more costly than stays with a routine discharge. The average length of an acute hospital stay for patients discharged to PAC was nearly 2 times longer than stays with a routine charge (7.0 days vs. 3.6 days). Among discharges to PAC, discharges to LTCHs were the longest—more 2 times longer than discharges to home with HHA services (13.5 days vs. 6.2 days). The average cost of inpatient stays discharged to PAC was $16,900, which was more than twice the average cost of inpatient stays with a routine discharge ($8,300). Stays discharged to LTCHs had the highest average cost, $36,800, and stays discharged to HHAs had the lowest average cost, $15,100, among all discharges to PAC. Table 1 shows patient and hospital characteristics for acute care hospital stays by discharge disposition. a About 6 percent all inpatient stays had missing value of race. b Discharges to IRFs and LTCHs were not identified in one State in the West region. As a result, the number of discharges to PAC may be underestimated by 1% with the assumption that the rate of discharge to IRFs and LTCHs in this State is the same as the national rate. Patients discharged to PAC were more likely to be older and to be White than those discharged routinely. Of discharges to PAC, 69.5 percent were among patients aged 65 years or older, compared with 22.4 percent for routine discharges. Patients younger than 18 years and between 18 and 44 years accounted for only 1.9 percent and 5.6 percent, respectively, of discharges to PAC, in contrast to 21.3 percent and 31.5 percent of routine discharges. Discharges to SNF had a higher percentage of patients aged 65 years or older (82.2 percent) than did the other three types of PAC settings. There was no difference in discharges to PAC versus routine discharges overall between females and males. However, a higher percentage of female patients were discharged to SNFs than to the three other types of PAC settings (60.5 percent vs. 56.1 percent for HHA, 53.7 percent for IRF, and 49.8 percent for LTCH). The percentage of White patients among discharges to PAC was higher than among routine discharges (71.4 percent vs. 58.4 percent). Hispanic patients represented only 6.5 percent of discharges to PAC but 13.4 percent of routine discharges. Discharges to IRFs were more likely to be from urban teaching hospitals than from rural or urban nonteaching hospitals. Urban teaching hospitals accounted for 51.3 percent of discharges to PAC but a higher percentage, 58.7, of all discharges to IRFs and a lower percentage, 46.8, of discharges to SNFs. Rural hospitals accounted for 10.5 percent of discharges to PAC but only 6.9 percent of discharges to IRFs and 7.2 percent of discharges to LTCHs. Rates of discharge to PAC differed across regions. Hospitals in the Northeast accounted for 17.1 percent of routine discharges but 24.3 percent of discharges to PAC. In contrast, hospitals in the West accounted for 21.2 percent of routine discharges but only 15.7 percent of discharges to PAC. The South accounted for 36.5 percent of PAC discharges and a higher rate of discharge to IRFs and LTCHs: 46.6 percent of discharges to IRFs and more than half of discharges to LTCHs were from the South. Figure 5 shows the rate of stays discharged to PAC in nine census divisions by payer group. Note: Discharges to inpatient rehabilitation facilities and long-term care hospitals were not identified in one State in the Pacific area. As a result, the rate of discharge to PAC in the Pacific area may be underestimated. Figure 5 shows the rate of discharge to postacute care for nine census divisions in 2013 by payer. New England: total: 32.8%, Medicare: 53.6%, Medicaid: 15.2%, private insurance: 17.8%, uninsured: 9.8%, other: 19.2%. Middle Atlantic: total: 27.5%, Medicare: 48.0%, Medicaid: 13.2%, private insurance: 15.1%, uninsured: 5.8%, other: 14.2%. East North Central: total: 24.6%, Medicare; 43.3%, Medicaid: 9.8%, private insurance: 12.0%, uninsured: 5.7%, other: 11.3%. West North Central: total: 20.4%, Medicare; 36.6%, Medicaid: 8.9%, private insurance: 10.4%, uninsured: 3.6%, other: 11.5%. South Atlantic: total: 22.2%, Medicare; 40.8%, Medicaid: 6.5%, private insurance: 12.1%, uninsured: 5.3%, other: 12.3%. East South Central: total: 22.5%, Medicare; 39.0%, Medicaid: 7.1%, private insurance: 11.1%, uninsured: 5.8%, other: 10.0%. West South Central: total: 18.0%, Medicare; 38.2%, Medicaid: 3.9%, private insurance: 9.0%, uninsured: 4.3%, other: 11.0%. Mountain: total: 17.8%, Medicare; 36.8%, Medicaid: 5.3%, private insurance: 10.6%, uninsured: 3.5%, other: 8.3%. Pacific: total: 17.8%, Medicare; 38.5%, Medicaid: 6.1%, private insurance: 8.4%, uninsured: 2.9%, other: 8.1%. Rates of discharge to PAC varied largely across nine census divisions. New England had the highest rate of discharge to PAC. Approximately 32.8 percent of all inpatient stays were followed by PAC use in the New England area in 2013. Moreover, 27.5 percent of inpatient stays in the Middle Atlantic area and 24.6 percent in the East North Central area were discharged to PAC, representing the second and third highest rates of discharge to PAC, respectively. Both the Pacific area and the Mountain area had the lowest rate of discharge to PAC, at about 17.8 percent. The geographic variation in discharge to PAC remained consistent within each payer group. Within each of the five payer groups, the relative difference in rates of discharge to PAC between census divisions remained consistent. For all divisions, rates of discharge to PAC were highest for Medicare-covered patients and lowest for uninsured patients. Only 4 out of 751 MS-DRG groups did not have any stays with discharges to PAC; however, the top 10 MS-DRGs accounted for 37 percent of all discharges to PAC settings. Table 2 displays the top 10 conditions and procedures with the most discharges to PAC, the number and rate of discharge to PAC for these conditions and procedures, and number and rate of discharge to each type of PAC. Note: Approximately 174,000 rehabilitation (MS-DRG 945, 946) stays were discharged to PAC. These cases were not included here because they are considered PAC stays rather than acute inpatient stays. Total hip/knee joint replacement was the most common condition/procedure with discharge to PAC. Roughly 756,000 total hip/knee joint replacement stays were discharged to PAC, accounting for nearly 10 percent of all discharges to PAC. Nearly 71 percent of total hip/knee joint replacement stays were discharged to PAC, and 54.1 percent of these discharges went home with HHA services. The highest rate of discharge to PAC was another orthopedic procedure—hip and femur procedures—for which 75.7 percent of stays were discharged to PAC. The top 10 conditions and procedures had a high rate of discharge to PAC. The 10 most common conditions and procedures had a high rate of discharge to PAC, ranging from 75.7 percent to 24.1 percent, compared with an overall rate of 22.3 percent. Two pulmonary diseases, chronic obstructive pulmonary disease and pneumonia, and cellulitis had a rate of discharge to PAC below 30 percent, the lowest among the 10 conditions and procedures. The top 10 conditions and procedures accounted for 37 percent of all stays with discharges to PAC. The 10 most common conditions and procedures discharged to PAC were distributed across five different major diagnostic categories: two musculoskeletal system, two circulatory system, two urinary system, two pulmonary system, and two infectious diseases with unspecified sites. The 10 most common conditions and procedures had a total of 2,941,400 stays with discharge to PAC and accounted for 37.0 percent of all discharges to PAC. They jointly represented 34.1 percent of discharges to HHAs, 39.4 percent of discharges to IRFs, 24.2 percent of discharges to LTCHs, and 40.7 percent of discharges to SNFs. Hospital urban/rural designation was based on the Core Based Statistical Area (CBSA). Hospitals residing in counties with a CBSA type of metropolitan were considered urban, while hospitals with a CBSA type of micropolitan or non-core were classified as rural. SA hospital is considered to be a teaching hospital if it has a residency program approved by the American Medical Association (AMA), is a member of the Council of Teaching Hospitals (COTH), or has a ratio of full-time equivalent interns and residents to beds of .25 or higher. Rural hospitals were not split according to teaching status because rural teaching hospitals were rare. Hospital bed size categories are based on hospital beds and are specific to the hospital's location and teaching status (see Table 3). Bed size assesses the number of short-term acute beds in a hospital. Hospital information was obtained from the AHA Annual Survey of Hospitals. Data on Hispanic ethnicity are collected differently among the States and also can differ from the Census methodology of collecting information on race (White, Black, Asian/Pacific Islander, American Indian/Alaska Native, Other (including mixed race)) separately from ethnicity (Hispanic, non-Hispanic). State data organizations often collect Hispanic ethnicity as one of several categories that include race. Therefore, for multistate analyses, HCUP creates the combined categorization of race and ethnicity for data from States that report ethnicity separately. When a State data organization collects Hispanic ethnicity separately from race, HCUP uses Hispanic ethnicity to override any other race category to create a Hispanic category for the uniformly coded race/ethnicity data element, while also retaining the original race and ethnicity data. This Statistical Brief reports race/ethnicity for the following categories: Hispanic, non-Hispanic White, non-Hispanic Black, Asian/Pacific Islander, and non-Hispanic Other. The HCUP National Inpatient Sample (NIS) is a nationwide database of hospital inpatient stays. The NIS is nationally representative of all community hospitals (i.e., short-term, non-Federal, nonrehabilitation hospitals). The NIS includes all payers. It is drawn from a sampling frame that contains hospitals comprising more than 95 percent of all discharges in the United States. The vast size of the NIS allows the study of topics at the national and regional levels for specific subgroups of patients. In addition, NIS data are standardized across years to facilitate ease of use. Over time, the sampling frame for the NIS has changed; thus, the number of States contributing to the NIS varies from year to year. The NIS is intended for national estimates only; no State-level estimates can be produced. Tian W. (AHRQ). An All-Payer View of Hospital Discharge to Postacute Care, 2013. HCUP Statistical Brief #205. May 2016. Agency for Healthcare Research and Quality, Rockville, MD. http://www.hcup-us.ahrq.gov/reports/statbriefs/sb205-Hospital-Discharge-Postacute-Care.pdf. 1 Medicare Payment Advisory Commission. Health Care Spending and the Medicare Program. MedPAC Annual Data Book. Section 8: Post-Acute Care. Washington, DC: Medicare Payment Advisory Commission; June 2015. 2 American Hospital Association. TrendWatch: Maximizing the Value of Post-Acute Care. Washington, DC: American Hospital Association; November 2010. 3 Medicare Payment Advisory Commission. Report to the Congress: Medicare Payment Policy. Chapter 7: Medicare's Post-Acute Care: Trends and Ways to Rationalize Payments. Washington, DC: Medicare Payment Advisory Commission; March 2015. 4 Medicare Payment Advisory Commission. Health Care Spending and the Medicare Program. Op. cit. 5 Buntin MB, Garten AD, Paddock S, Saliba D, Totten M, Escarce JJ. How much is post-acute care use affected by its availability? Health Services Research. 2005;40(2):413-34. 6 Barrett M, Hickey K, Coffey R, Levit K. Population Denominator Data for Use with the HCUP Databases (Updated with 2014 Population Data). HCUP Methods Series Report #2015-07. September 1, 2015. U.S. Agency for Healthcare Research and Quality. http://www.hcup-us.ahrq.gov/reports/methods/2015-07.pdf. Accessed February 17, 2016. 7 Agency for Healthcare Research and Quality. HCUP Cost-to-Charge Ratio (CCR) Files. Healthcare Cost and Utilization Project (HCUP). 2001-2013. Rockville, MD: Agency for Healthcare Research and Quality. Updated November 2015. http://www.hcup-us.ahrq.gov/db/state/costtocharge.jsp. Accessed February 17, 2016. 8 For additional information about the NHEA, see Centers for Medicare & Medicaid Services (CMS). National Health Expenditure Data. CMS Web site May 2014. http://www.cms.gov/Research-Statistics-Data-and-Systems/Statistics-Trends-and-Reports/NationalHealthExpendData/index.html?redirect=/NationalHealthExpendData/. Accessed February 17, 2016. 9 American Hospital Association. TrendWatch Chartbook, 2014. Table 4.2. Distribution of Inpatient vs. Outpatient Revenues, 1992-2012. https://www.aha.org/system/files/research/reports/tw/chartbook/2016/2016chartbook.pdf. February 17, 2016. 10 U.S. Census Bureau. Census Regions and Divisions of the United States. https://www2.census.gov/geo/pdfs/maps-data/maps/reference/us_regdiv.pdf. Accessed November 8, 2017. Internet Citation: Statistical Brief #205. Healthcare Cost and Utilization Project (HCUP). June 2016. Agency for Healthcare Research and Quality, Rockville, MD. www.hcup-us.ahrq.gov/reports/statbriefs/sb205-Hospital-Discharge-Postacute-Care.jsp.